He finally did it. Five years after he last won a stage in a major Tour, 2004 Giro champion Damiano Cunego (Lampre) soloed to victory in the Vuelta’s first summit finish at Aitana. 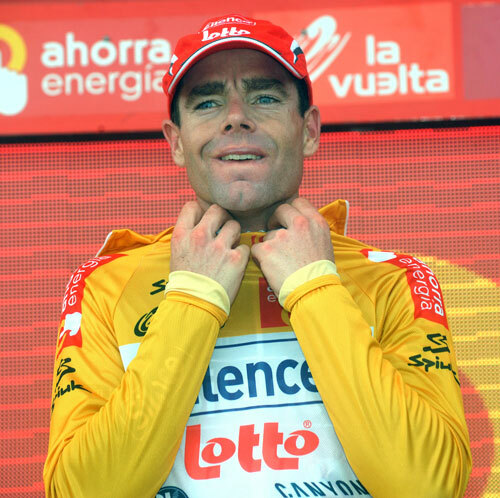 Overall, Cadel Evans (Silence-Lotto) now leads. With just two kilometres left to race of the final 22 kilometre monster climb, Cunego attacked the group of around a dozen favourites and powered away. The Lampre rider stormed past daylong breakaway David Moncoutie (Cofidis) almost within sight of the mist-enshrouded finishing gantry. This victory had been a long time coming, but it was a classy win nonetheless. All but out of the fight for the overall classification after an uneven first week, Cunego was followed onto the winner’s podium by Aussie Cadel Evans (Silence-Lotto), the new race leader. After Caisse d’Epargne had maintained a high pace at the front of a fast-dwindling peloton on the final climb of Aitana, the Australian managed to bridge across after first Ivan Basso (Liquigas) and then Alejandro Valverde (Caisse d’Epargne) attempted to break away close to the finish. Neither Basso nor Valverde succeeded, whilst Evans squeezed past the Spaniard in the final metres to take fourth on the stage and claim the Vuelta’s maillot de lider. 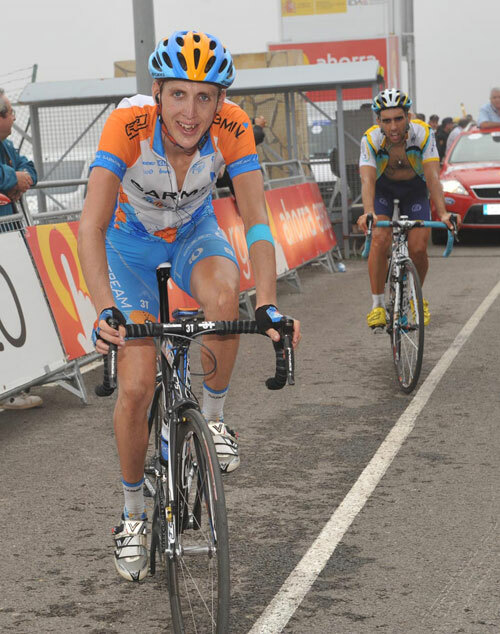 On the same arduous 204 kilometre stage that took in no less than eight classified climbs and over 3,500 metres of climbing, Tour runner-up Andy Schleck (Saxo Bank) abandoned. At the same time, two possible overall favourites, Frank Schleck (Saxo Bank) and Alexandre Vinokourov (Astana) both lost all chances of winning when they cracked on the Aitana. However, Evans is very much in the thick of the action, and is now one of the few currently active riders to have led in all three major Tours. Together with Robert Gesink (Rabobank) and Basso, the Australian should provide the main foreign threat to Spain’s top trio – Alejandro Valverde (Caisse d’Epargne), Samuel Sanchez (Euskaltel-Euskadi) and Ezequiel Mosqueras (Xacobeo-Galicia). Honourable mention must be made to Ireland’s Daniel Martin (Garmin-Slsiptream), having placed 14th in the first mountain stage of his first ever grand tour. With another mountainous stage on Monday, and all the top challengers inside the two minute mark of Evans, the chances are the Australian will have a real fight on his hands.